My must-have specialized tool #372: A ‘manly’ magnetized dish from the hardware store for my pins. It’s huge, and sticks to various places on your machine when you need it to. If you do spill pins, it makes picking them all up easier. It is usually cheaper than the silly plastic pink things with a tiny magnet that craft superstores sell. 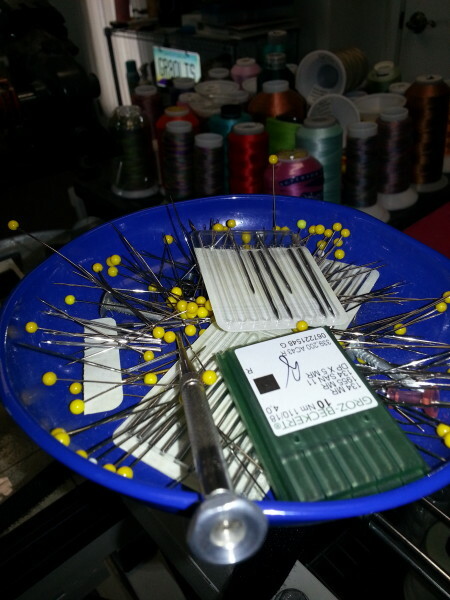 I also store my machine needles and screwdriver there, so they are convenient and easy to find for each machine. This great little tool will stick to your rollers as you pin the quilt.